Our latest website launch is for Intelletrace, a company that we consider to be more collaborators than clients. 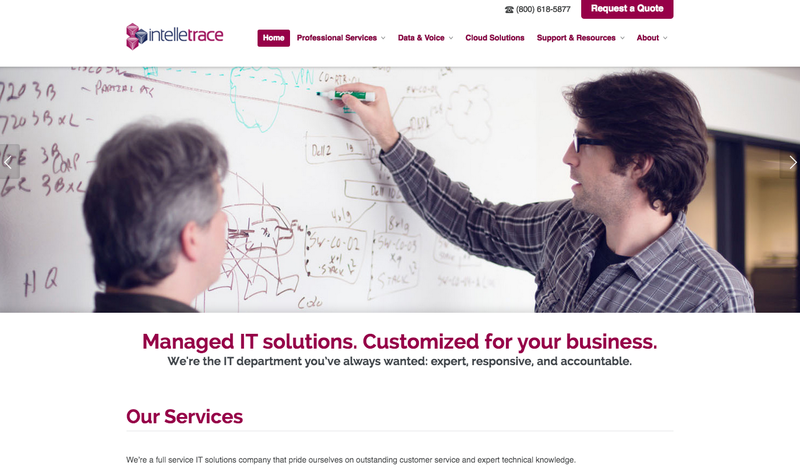 As a full-service IT solutions resource, Intelletrace is the company that Kiosk trusts with our own network maintenance and support. They’ve been great people to work with, and when we were given the opportunity to provide creative solutions services and redesign their website, we wanted to highlight the human side of their IT services, including their outstanding customer services. We were also able to organize site content in a way that showcases the full range of services and product offerings, better optimize the site for search marketing and organize a photoshoot to show off the human side of the company, by putting the experts at Intelletrace front and center. At Kiosk, we believe that first-class customer service and smart technology is a winning combination. We’re very excited to partner with like-minded businesses, and very pleased with our ongoing collaboration with Intelletrace.